I searched for the source of this image, and couldn't match it with a specific business. 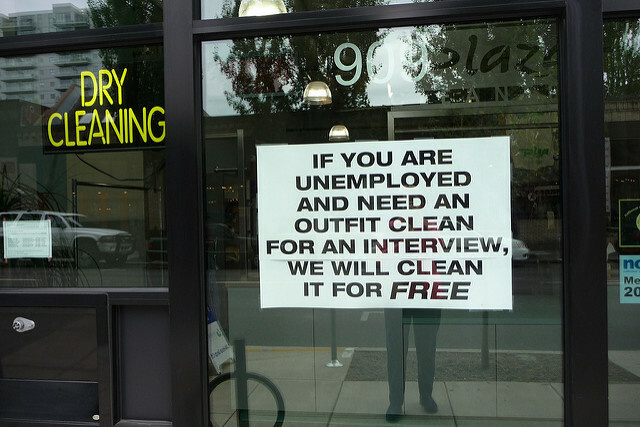 That observation suggests, indeed, this cleaner has it right when it comes to generosity. Craig Galati, president of the Society for Marketing Professional Services (SMPS). has published a note that explains the virtues of generosity. Be thankful for what you have. We all have much for which to be thankful. Focus on these good things in your life and be grateful for what you have. This will help your attitude stay positive and in turn create more things in which to be thankful. It’s a great cycle. Stay thankful and the world will send you more reasons for which to be thankful. Nothing makes you feel better than giving. Several years ago, after my mother had passed away, my mind was in a bad state. I couldn’t seem to shake the negative feelings that I had and these feelings were penetrating every aspect of my life. I’m sure I wasn’t very fun to be around, and I treated just about everyone I came into contact with terribly. A friend suggested that I needed to get out and give back to my community–that volunteering for something would help me deal with all I was going through. Boy, was he right. I volunteered serving meals at a local homeless shelter and not long after, my positive attitude returned. I’ve remembered this, and I try to work volunteering into my life on a more regular basis. I’m pretty sure that my small acts help the world, but I absolutely know that I get more from the gift than the gift itself. And it helps me to be true to what I believe. My only concern with his observations arises from the flip-side of generosity — seeking to turn it into a marketing story. Here, as a publisher, there is an interesting dichotomy. We recognize the value and importance of recognizing worthy community service and charitable initiatives, and generally bend the rules about expecting commercial businesses to pay for self-serving publicity when it comes to community service. This means, in other words, free positive publicity. But I run into problems when the generosity turns into a public relations game — where businesses do some small acts of goodness, and then turn on the PR machine and expect us (as media) to wonderfully retell their narratives. The story becomes even more challenging when I speak with leaders of real charitable organizations who tell of being offered junk surplus “in kind” inventory — and then that the company giving this crap expects the non-profit to gloriously thank the business for the so-called gift. Is there a balance between letting the community know you are doing good things, and being a creep and overplaying your generous spirit, or worse, faking your generosity and seeking publicity for it. I think so, and have concluded that great generosity is much like great customer service. Both work if they are real; and they work wonders when your clients (and relevant community service organizations) announce or share your goodness. But it doesn’t work when you shout from the rooftop the story yourself. Sure, go ahead and share internally your kudos and good words from outside organizations, and we’ll certainly learn about generous deeds if you ask us to support your cause — rather than your business — with some free publicity.